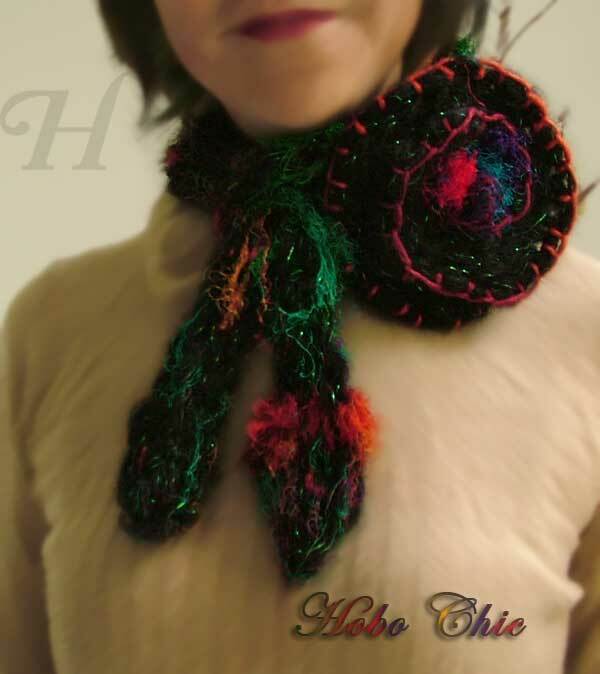 If you are into handmade crafts, this Bright and Handy neck warmer scarf is just the ticket. It is easy to make and absolutely, eye-catchingly fun to wear. This scarf is a sure neck warmer. It is made ready to wear with Ease. Made from fluffy soft handspun 100% wool, you have the choice of varying the style for subtle differences and levels of coziness. .. you can leave both "tails" hanging down. 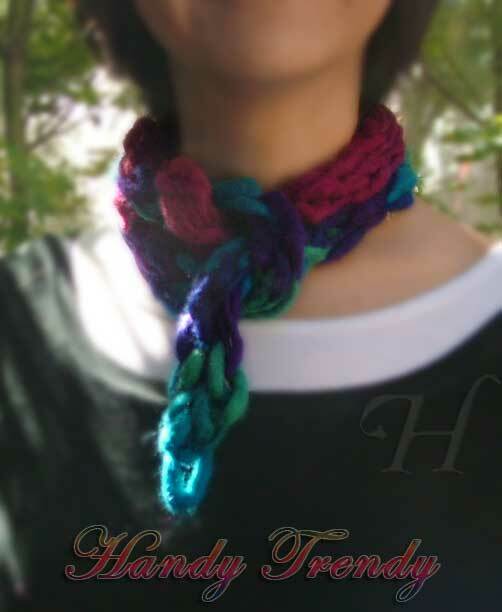 There is an "inbuilt loop" in the scarf already through which you pull the tails through. 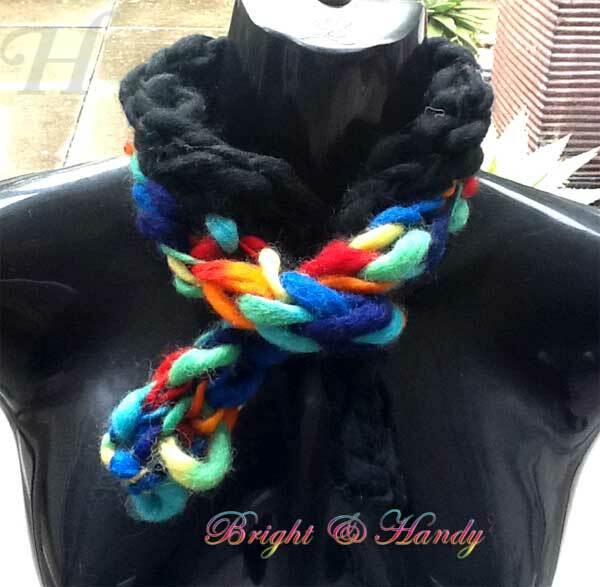 It can be worn loosely or snugly. 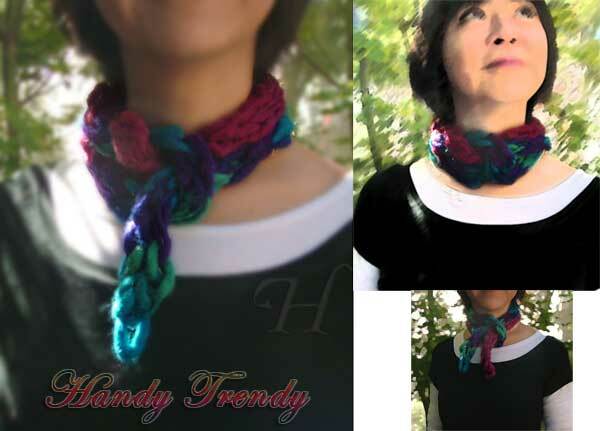 This next pic shows some of the different ways and looks for this handmade scarf. 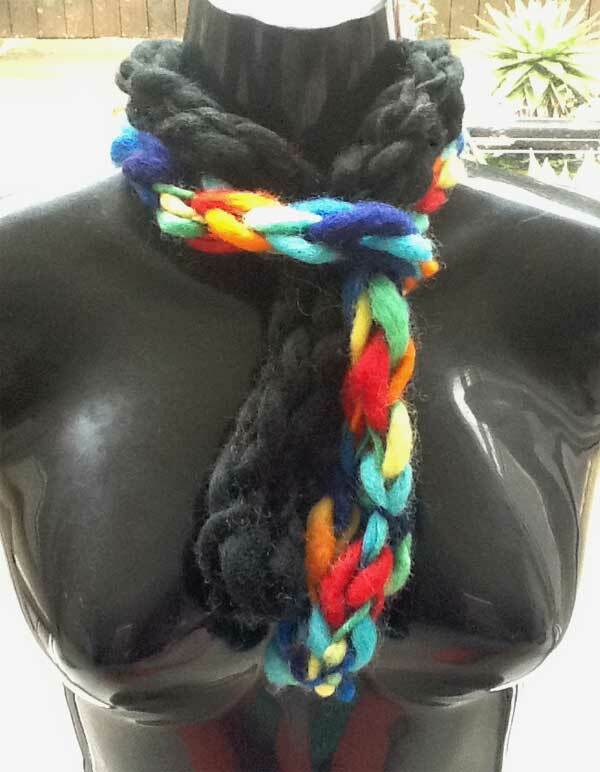 Note that even turning the scarf "upside down" (either with black band on top or below) can give you a different look.. This soft 100% wool has been handspun by the native women in Nepal. They are from a community of women within a co-op that helps them earn income and independence. The technique used is basic Finger Knitting. 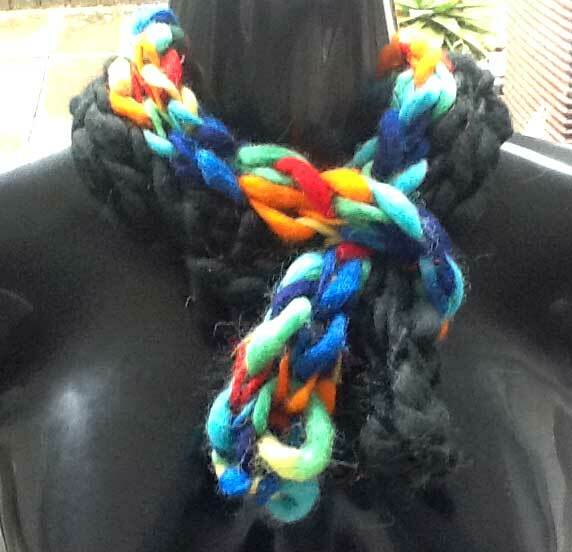 Just make the length long enough to enable doubling to very loosely fit around neck. 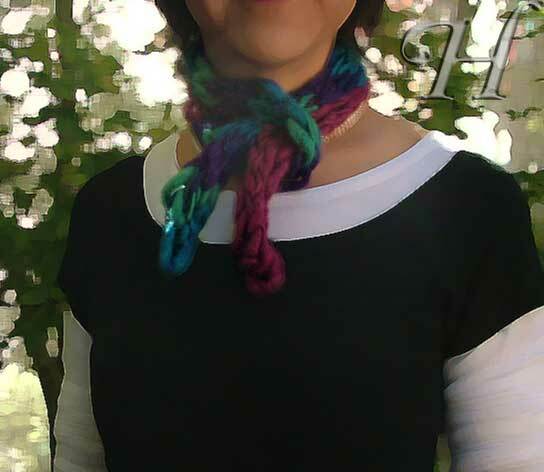 Sew up both sides together so that you end up with a loop (for the scarf tails) at the fold and 2 "tails". Wash separately. For color safety, do not wash together with other items. Instead of creating another page, I have decided to put these handy, finger knitted scarves all on one page. This Handy Trendy is made in the same way. This is one handmade craft that is deliciously fun, and quick & easy to make. The best part is of course, you can wear them in multiple styles and with such ease! 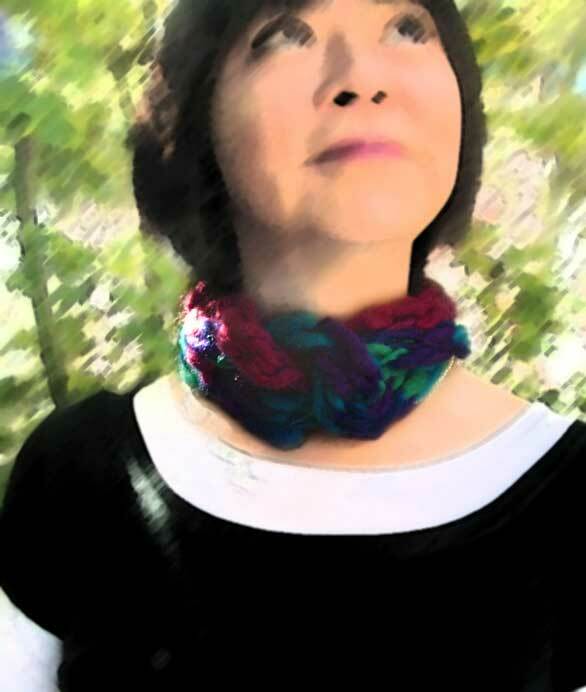 This Handy Trendy neck warmer is also made from thick thin 100% wool from Nepal and yes, also finger knitted. Please refer to as per above for Maintenance and Care for this handmade crafted item. 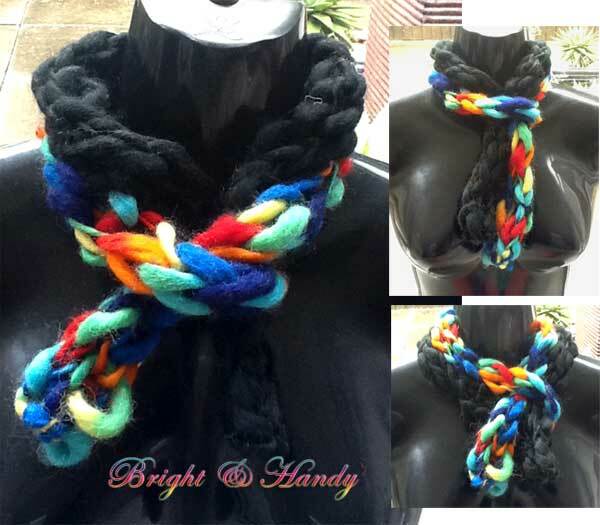 This handy necklet is finger knitted. 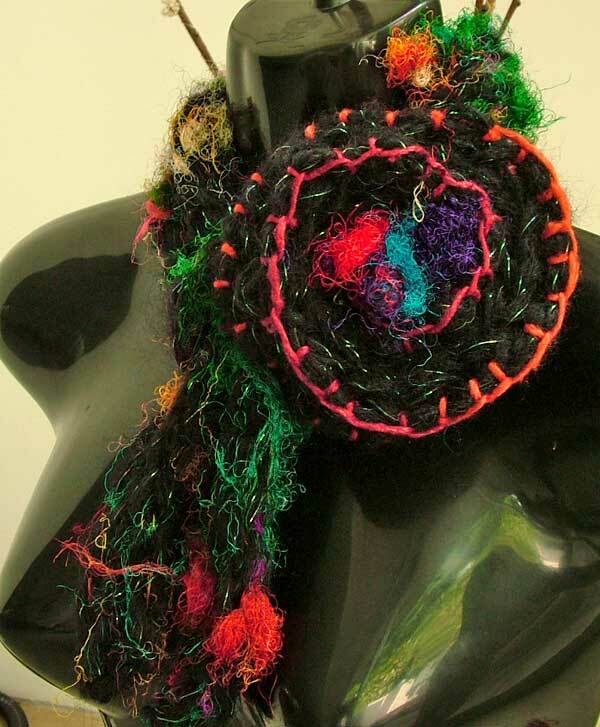 Worked with 2 strands of mohair yarn and "laced" with sari silk which is worked into the scarf during knitting for a truly unique Hobo Chic look. 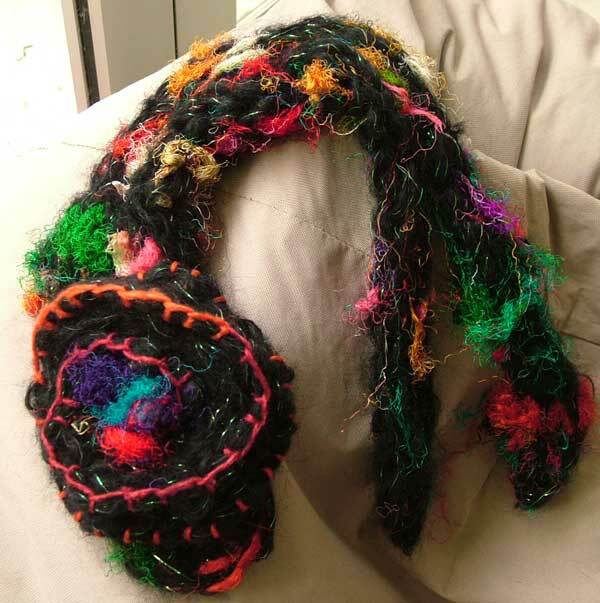 The flower (which is attached later - near the "loop" in the scarf") is also finger knitted. It is then sewn in a circle to form the flower. The center of the flower is made from a bunch of sari silk and sewn into place. 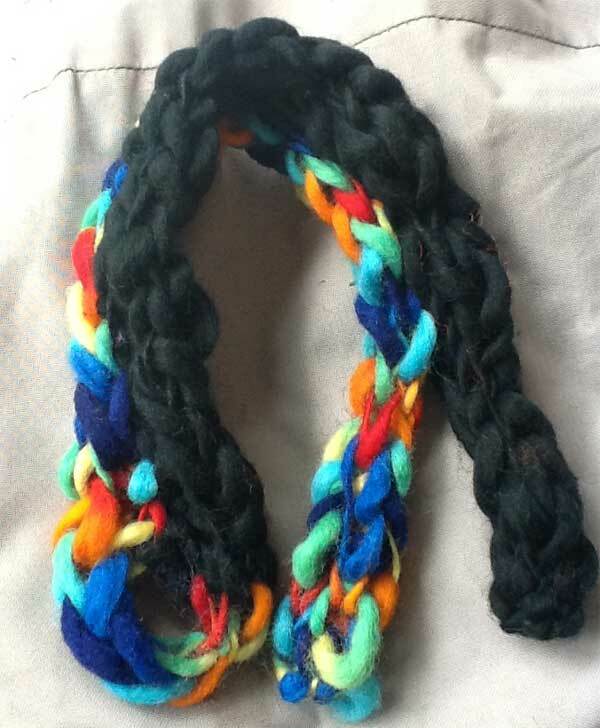 The necklet is made by folding the long strand of finger-knitted piece in 2, leave a small loop at the folded end and the rest sewn together, leaving a bit of tail. The tail will feed into the small loop at the folded edge for easy-wear. 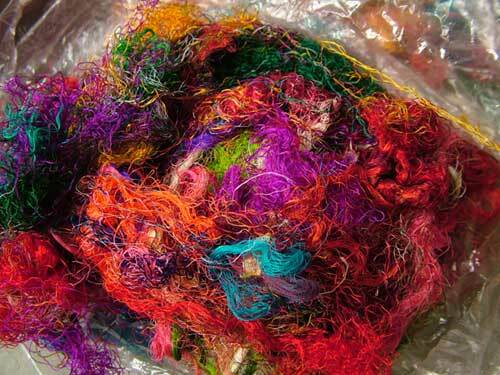 The following photo shows what recycled sari silk looks like.